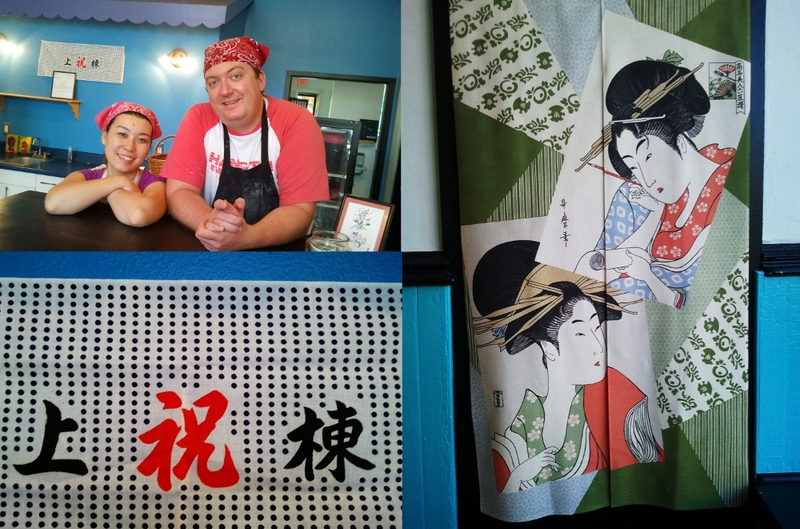 Great news there is now a Japanese restaurant in Mineral Point. Hiroko and Chris Messer have recently opened Kusaka, meaning “under the sun”, named after Hiroko’s grandmother. The couple made a big move from Sendai, Japan (where an earthquake triggered tsunami caused much devastation last year) to Dodgeville. Now closer to Chris’ side of the family, they are slowly but surely adjusting to life in the states. The food industry is nothing new to Chris and Hiroko. Hiroko had been working in food even before the couple met. Teaching English as a Second Language brought Chris from Cuba City to Japan. Hiroko worked as a waitress in the same building where he taught. They met, fell in love, and eventually operated a hamburger joint; no doubt to share some American love to the Japanese. Now they are here sharing Hiroko’s Japanese home cooking. Kusaka has been open for just a little over a month now. This place is a hot spot. We have already eaten there about five times and we cannot get enough of Hiroko’s cooking. I’m especially enamored with the pork and cabbage gyozas (potstickers). In one bite, you get a little crunch, the soft and slight chewiness of the wrap, and the flavorful and moist filling. There is a spicy soy dipping sauce served with it but it stands quite well on its own. Another star is the handmade ramen. Handmade ramen. I do not know anyone else in Wisconsin making these noodles. The closest place to get them would be Chicago. What a treat! Three types of broth are available; soy, miso, and chicken. I prefer the miso and Keith likes the chicken. Each bowl is gorgeously filled with the noodles in rich broth, spinach, dried seaweed, and flecks of black and white sesame seeds. Other topping options are some sliced roast pork or chicken. The tofu salad was a first for me. The soft and delicate tofu is slightly sweet. It plays well with the salty soy, spicy ginger, fragrant scallions, and the aggressive fishiness of the bonito flakes. One more thing they have is Ramune soda. The bottle is distinctive because you have to push a marble down to break the seal. It also looks like a cute alien. I enjoy the strawberry flavor. A special item we’ve sampled that is not on the menu yet is the Castella cake. It’s a sponge cake that has been adopted from the Portuguese (who traded and did missionary work in Japan in the 16th century). It is elegant in taste, not too sweet, not too fatty, and not too heavy. Other future menu items include matcha (green tea) ice cream, tempura, and fried chicken. We’ve tasted the entire menu already. It is good comfort food with a twist. I really cannot wait for the cold weather to come because I think it’s the only ingredient missing from that bowl of ramen! Thank you Hiroko and Chris for bringing a little taste adventure to the area. The restaurant is located in the space which formerly housed Atomic Ice. 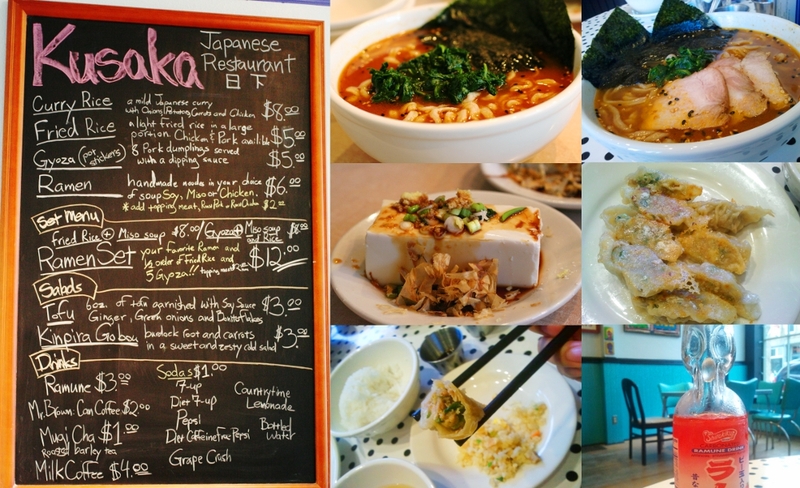 Kusaka is open for business from 11AM-2PM for lunch and 5PM-9PM for dinner everyday except on Wednesdays. Gallery | This entry was posted in Food and tagged Chris Messer, Driftless Appetite, Driftless Area, food, Hiroko Messer, Japanese, Leslie Damaso, restaurant. Bookmark the permalink. I lived in Japan for 2 years and since I have been back in the U.S. I was beginning to think I would never again be able to have a really good bowl of miso chashu ramen – that was true until last night (9/7/12) when my wife, son and I went to Kusaka Restaurant in Mineral Point! Anybody who wants “the real deal” ramen should try out Kusaka! So glad you enjoyed your experience at Kusaka! Thanks for the comment. Yes. They are a great addition to your neck of the woods!